2) Based on comparable cost analysis for fuel treatment methodologies (prescribed burns & mowing where possible); each wild horse assigned from BLM/USFS holding and into remote forest fuel abatement (wildfire grazing via www.WHFB.us) role provides approximately $72,000.00 per horse in value over the course of its 20-year life span (average) in the wilderness. This figure is based on each wild horse grazing about 5.5 tons of grass and brush per year in wilderness areas where other treatments and methods are impractical. 3) Studies overwhelmingly prove that the removal of fine fuels from wildfire prone areas changes both the frequency and intensity of wildfire. "By altering the quantity and distribution of fuel supplies, large herbivores can shape the frequency, intensity, and spatial distribution of fires across a landscape." "The removal of large herbivores has adverse effects on landscape structure and ecosystem functioning. In wetter ecosystems, the loss of large herbivores is associated with an increased abundance of woody plants and the development of a closed-canopy vegetation. In drier ecosystems, reductions of large grazers can lead to a high grass biomass, and thus, to an increase in the frequency and intensity of wildfires. Together, with the loss of a prey base for large carnivores, these changes in vegetation structures and fire regimes may trigger cascades of extinctions (Bakker et al., 2016; Estes et al., 2011; Hopcraft, Olff, & Sinclair, 2009; Malhi et al., 2016)." "We find that with the application of preventive fuel management, the value of the forest is greater and less variable than in the case where prevention management spending is not applied to the forest. We also find that prevention spending lowers the number of devastating large fire events. The mean value of the forest over a 50‐year time horizon in the no prevention management case is $536M with a standard deviation of $111.7M. When prevention is determined by the successive application of our optimal control problem, we find that the mean value of the forest over 50 years to be $671M with a standard deviation of $34.0M. This result illustrates that there are real economic costs associated with using funding for fuel management to fund immediate fire suppression. Perhaps, more surprisingly, we find that when optimal prevention management is employed, not only are high suppression costs drastically reduced, total spending on fire management (prevention and fire suppression) is less than the case without prevention management. In the case without prevention management spending, $236M was spent on average on fire suppression over the course of 50 years. In the case with applying optimal prevention management spending, only $42M was spent on average on suppression over 50 years and $65M was spent on prevention management. By comparison, $40M–$50M was spent fighting the Las Conchas fire. In our work with unknown fire sequences, we observed an 88% reduction in suppression spending on average with prevention management, and a 55% reduction in spending overall. This result provides hope that a more careful integration of fire prevention into wildfire management plans may actually reduce the cost of these plans." • America is faced with a growing problem related to catastrophic wildfire, not the least of which includes loss of life, property, forests and timber, grazing lands and related costs of insured and uninsured losses now growing into the hundreds of $-billions annually. • The depletion of millions of deer in the western states over the past five decades has seriously damaged the delicate balance of the forest and grassland ecosystems. • Today, Oregon & California's deer population have been decimated. CA deer population alone has dropped by approximately 2 million deer over the past five decades. The loss of these critically important native species grazers, also known as 'large-bodied' herbivores, has resulted in extreme excesses in the amount of annual grass and brush left ungrazed across the landscape during longer and hotter summer fire seasons. • This is particularly important in regard to the relatively recent evolution of catastrophic wildfire on the landscape. Wildfire is made catastrophic because of the abnormal heat generated due to excessive amounts of fast-burning fuel that projects tremendous heat energy into the landscape and all other available fuels. Rapid-burning grass and brush fuels are known as fire accelerants that in many catastrophic wildfires are also the primary fueling agents. • These mega-hot wildfires are extremely harmful to watersheds, at a time when more fresh water is needed for agriculture as well as for fisheries and wildlife that also depend on quality watersheds. • Concurrently, the growing competition for industrial and livestock uses of public lands has generated serious socioeconomic issues for all stakeholders. The rancor from disputes is at an all-time high and a sustainable cost-effective compromise is required. • Interestingly, a cost-effective plan (WHFB) that addresses the disputes between the majority of stakeholders around the issue of livestock grazing and wild horses and burros on public lands also helps to mitigate losses due to catastrophic wildfire via fuel abatement grazing in remote wilderness areas, many of which are now known as 'firesheds' due to the regularity of wildfire in such remote areas. • The solution known as Wild Horse Fire Brigade relocates wild horses and burros away from areas of competition with livestock enterprises and back into their evolutionary roles of reducing grass and brush fuel loading in remote wilderness areas that are prone to catastrophic wildfire. This ends the 'range war' and eliminates the needs for brutal roundups and artificial intervention into wild horse and burro ecology using chemicals such as PZP. • It is in these remote wilderness areas that fire suppression costs are the highest as a result of the necessity of aerial suppression efforts that can reach $1 million/hour. • Even though such remote wilderness areas in the West have both abundant vegetation and water, they are not suited to livestock production due to remote rugged terrain, difficult access and abundant apex predators, all of which significantly reduce profitability. These conditions are nevertheless ideal for wild horses and burros that evolved on the American landscape in these ecosystems where the evolutionary process of natural selection controls equid populations and enhances equid genetics. 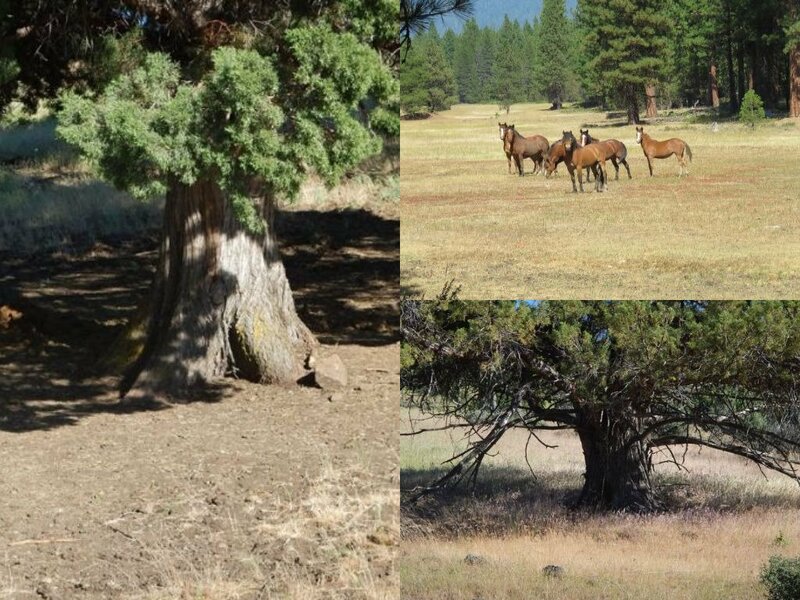 • Rewilding native species wild horses and burros to re-balance wilderness ecosystems is the paradigm shift needed to correctly manage wilderness landscapes of the 21st century and eliminate unnecessary conflict on multiple-use public land areas.